Absolute waterfront property set on 22 acres of native bush with landscaped native gardens on a very private beach. A peaceful valley filled with bird song and the sounds of the sea. A three level architecturally designed house with extensive decks, very open plan, rooftop spa, sea and bush views from all levels. Outdoor lounge and dining, bbq, hot out door shower. No visible neighbours. The Hideaway looks north to the Limerick Islands and Mimiwhangata Farm Park. Sheltered safe swimming beach. Kilometres of white sandy beaches at your door step, walk around the point for a surf, dive in the bay or fish off the rocks. 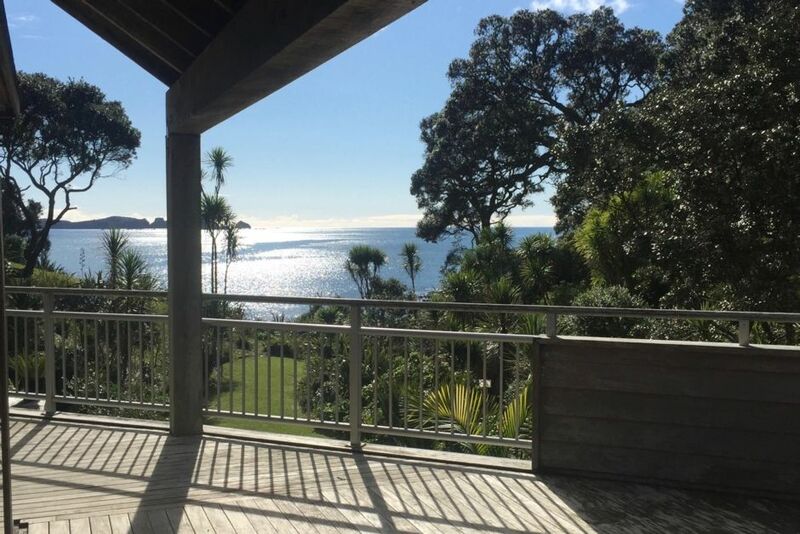 View our tour on youtube 'A Slice of Whananaki Hideaway'. Prices are for a maximum of eight persons. Extra guests, tents or pets by negotiation. surfing diving fishing kitesurfing swimming boating hiking, we have it all. On arrival after a 40 minute drive from the main road we were greeted at the house for a mere 30 seconds by the owner. We weren’t shown around personally, just left with list with a few instructions on the bench.We felt she could have taken a little more time to explain the house rather than leave us to fend for ourselves. The listing stated 5 bedrooms and could sleep up to 12. This was not correct. Pull out couch bed in lounge was not practical to sleep on with feeling the springs and bars through mattress. There were no basics provided .... just salt and pepper, a couple of tea bags and some coffee beans. The nearest shop is not a pleasant drive to get to on a narrow windy gravel road. The house itself although beautiful, but because of its open plan design allowed sound to travel everywhere which was annoying. The beach was not suitable for swimming due to an undertow. This review was unanimous from all 7 guests. Overall disappointed. The perfect place for a holiday. House, gardens, views, beaches all five star. Spectacular position and home. Very accommodating host who made it possible rebook our stay. It was our dream place to stay and would love to bring our family back here. From the secluded coastal position to the ability to walk for miles on the beach to the diving and fishing and art filled home. Our host was amazing - meeting us and making us feel welcome to rescheduling our stay at last minute. For those that don’t like off road driving then that would be the only off putting part of our journey. The beautiful architecturally designed house had amazing views and you felt very private. Thanks. The house was big enough with indoor and outdoor areas to accommodate our group of 8 family members, everything was provided only had to bring few clothes and lots of food and drinks so we don’t need to leave the place at all. Karen is very helpful offered to bring us some supplies that we run out of. I always judge a place by the quality of the toilet paper that’s provided which tells me the love and care the owner has for their place and the guests and Karen does care for both. I do want to write more good things about the private beach, the house and the surrounding landscape but then it will be along story so I will finish with we all had a relaxed and most memorable holiday.